This article is about district courts of the U.S. federal judicial system. For district courts of various U.S. states' judicial systems, see Courts of the United States § Courts by state of the United States. In contrast to the Supreme Court, which was established by Article III of the Constitution, the district courts were established by Congress. [note 1] There is no constitutional requirement that district courts exist at all. Indeed, after the ratification of the Constitution, some opponents of a strong federal judiciary urged that, outside jurisdictions under direct federal control, like Washington, D.C., and the territories, the federal court system be limited to the Supreme Court, which would hear appeals from state courts. This view did not prevail, however, and the first Congress created the district court system that is still in place today. There are other federal trial courts that have nationwide jurisdiction over certain types of cases, but the district court also has concurrent jurisdiction over many of those cases, and the district court is the only one with jurisdiction over civilian criminal cases. The United States Court of International Trade addresses cases involving international trade and customs issues. The United States Court of Federal Claims has exclusive jurisdiction over most claims for money damages against the United States, including disputes over federal contracts, unlawful takings of private property by the federal government, and suits for injury on federal property or by a federal employee. The United States Tax Court has jurisdiction over contested pre-assessment determinations of taxes. A judge of a United States district court is officially titled a "United States District Judge". Other federal judges, including circuit judges and Supreme Court Justices, can also sit in a district court upon assignment by the chief judge of the circuit or by the Chief Justice of the United States. The number of judges in each district court (and the structure of the judicial system generally) is set by Congress in the United States Code. The President appoints the federal judges for terms of good behavior (subject to the advice and consent of the Senate), so the nominees often share at least some of his or her convictions. In states represented by a senator of the President's party, the senator (or the more senior of them if both senators are of the president's party) has substantial input into the nominating process, and through a tradition known as senatorial courtesy can exercise an unofficial veto over a nominee unacceptable to the senator. A judge who has reached the age of 65 (or has become disabled) may retire or elect to go on senior status and keep working. Such senior judges are not counted in the quota of active judges for the district and do only whatever work they are assigned by the chief judge of the district, but they keep their offices (called "chambers") and staff, and many of them work full-time. A federal judge is addressed in writing as " The Honorable John/Jane Doe" or "Hon. John/Jane Doe" and in speech as "Judge" or "Judge Doe" or, when presiding in court, "Your Honor". District judges usually concentrate on managing their court's overall caseload, supervising trials, and writing opinions in response to important motions like the motion for summary judgment. Since the 1960s, routine tasks like resolving discovery disputes can, in the district judge's discretion, be referred to magistrate judges. Magistrate judges can also be requested to prepare reports and recommendations on contested matters for the district judge's consideration or, with the consent of all parties, to assume complete jurisdiction over a case including conducting the trial. Federal magistrate judges are appointed by each district court pursuant to statute. They are appointed for an eight-year term and may be reappointed for additional eight-year terms. A magistrate judge may be removed "for incompetency, misconduct, neglect of duty, or physical or mental disability". A magistrate judgeship may be a stepping stone to a district judgeship nomination. Each district court appoints a clerk, who is responsible for overseeing filings made with the court, maintaining the court’s records, processing fees, fines, and restitution, and managing the non-judicial work of the court, including information technology, budget, procurement, human resources, and financial. Clerks may appoint deputies, clerical assistants, and employees to carry out the work of the court. The clerk of each district court must reside in the district for which the clerk is appointed, except that the clerk of the District of Columbia and the clerk of the Southern District of New York may reside within twenty miles of their respective districts. The Judiciary Act of 1789 authorized the Supreme Court and the judge of each U.S. District Court to appoint a clerk to assist with the administration of federal judicial business in those courts. The clerk for each district court was to also serve as clerk of the corresponding circuit court. The Judiciary Act required each clerk to issue the writs summoning jurors and "to record the decrees, judgments and determinations of the court of which he is clerk." The Judicial Code (28 U.S.C. § 751) provides that the clerk is appointed, and may be removed, by the court. The clerk's duties are prescribed by the statute, by the court's customs and practices, and by policy established by the Judicial Conference of the United States. The clerk is appointed by order of the court en banc to serve the entire court. The role of the clerk and deputies or assistants should not be confused with the court's law clerks, who assist the judges by conducting research and preparing drafts of opinions. To be eligible to serve as a clerk, a person must have a minimum of 10 years of progressively responsible administrative experience in public service or business that provides a thorough understanding of organizational, procedural, and human aspects of managing an organization, and at least 3 of the 10 years must have been in a position of substantial management responsibility. An attorney may substitute the active practice of law on a year-for-year basis for the management or administrative experience requirement. Clerks do not have to be licensed attorneys, but some courts specify that a law degree is a preference for employment. Unlike some state courts, the power of federal courts to hear cases and controversies is strictly limited. Federal courts may not decide every case that happens to come before them. In order for a district court to entertain a lawsuit, Congress must first grant the court subject matter jurisdiction over the type of dispute in question. Generally, a final ruling by a district court in either a civil or a criminal case can be appealed to the United States court of appeals in the federal judicial circuit in which the district court is located, except that some district court rulings involving patents and certain other specialized matters must be appealed instead to the United States Court of Appeals for the Federal Circuit, and in a very few cases the appeal may be taken directly to the United States Supreme Court. United States Court House in downtown Los Angeles, California, one of several sites used by the Central District of California. The Central District of California is the largest federal district by population;  it includes all five counties that make up Greater Los Angeles. By contrast, New York City and the surrounding metropolitan area are divided between the Southern District of New York (which includes Manhattan, The Bronx and Westchester County) and the Eastern District of New York (which includes Brooklyn, Queens, Staten Island, Nassau County and Suffolk County). New York suburbs in Connecticut and New Jersey are covered by the District of Connecticut and District of New Jersey, respectively. Most extinct district courts have disappeared by being divided into smaller districts. 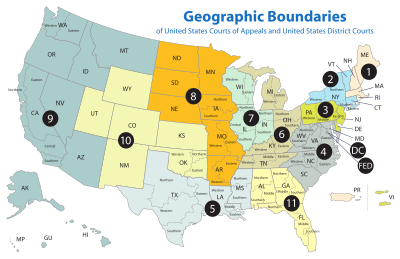 The following courts were subdivided out of existence: Alabama, Arkansas, California, Florida, Georgia, Illinois, Indiana, Iowa, Kentucky, Louisiana, Michigan, Mississippi, Missouri, New York, North Carolina, Ohio, Pennsylvania, Tennessee, Texas, Virginia, Washington, West Virginia, Wisconsin. Between 1794 and 1797, the United States District Court for the District of North Carolina was divided into the United States District Courts for the Districts of Edenton, New Bern, and Wilmington. Between 1801 and 1802, the United States District Court for the District of New Jersey was divided into the United States District Courts for the Districts of East Jersey and West Jersey. Between 1911 and 1961, the United States District Court for the District of South Carolina was divided into the United States District Courts for the Eastern and Western District of South Carolina. The United States District Court for the Eastern District of Illinois was eliminated and a new United States District Court for the Central District of Illinois was created in its place on October 2, 1978. There are a few additional extinct district courts that fall into neither of the above two patterns. From 1801 to 1802, the District of Columbia and pieces of Maryland and Virginia formed the United States District Court for the District of Potomac, which was the first United States district court to cross state lines. During the same period, the United States District Court for the District of Norfolk was carved out of another piece of Virginia. The United States District Courts for the Districts of Maryland and Virginia remained during this brief period. From 1801 to 1802, and again from 1802 to 1872, the state of North Carolina was subdivided into the United States District Courts for the Districts of Albemarle, Cape Fear, and Pamptico. These courts were extinguished when the state was reorganized into the United States District Courts for the Eastern and Western Districts of North Carolina. United States District Court for the District of Orleans. This court was renamed the United States District Court for the District of Louisiana when the Territory of Orleans became the State of Louisiana. United States District Court for the Canal Zone. This court was abolished, effective March 31, 1982, as part of the process of returning the Canal Zone to Panama. Cases then pending in the Canal Zone court were transferred to the United States District Court for the Eastern District of Louisiana in New Orleans. United States Court for China. This court functioned as a district court between 1906 and 1943. It had jurisdiction over American citizens in China. ^ Article III of the Constitution provides that the "judicial power of the United States, shall be vested in . . . such inferior courts as the Congress may from time to time ordain and establish." ^ In some situations, federal law provides both for the exclusive jurisdiction of federal courts and for the immunity of the defendant from the power of those courts. One example of this is patent-infringement claims against a state government: only the federal courts may hear patent cases, but the states have sovereign immunity from such suits under the Eleventh Amendment. Although a state may choose to waive its immunity in such a case and allow it to proceed to trial, if it does not do so, the plaintiff has no recourse. This doctrine was reaffirmed by the Supreme Court of the United States in Florida Prepaid Postsecondary Education Expense Board v. College Savings Bank, 527 U.S. 627 (1999). ^ Nearly all district courts have a Local Rule 11.1 or 83.1 that describes the appropriate state judicial institution which admits attorneys to practice (either the state bar association or an office or committee of the state supreme court). ^ Article III Judges Division (2001-08-01). "An Introduction for Judges and Judicial Administrators in Other Countries" (PDF). The Federal Court System in the United States. Administrative Office of the United States Courts. Archived from the original (PDF) on 2009-05-13. Retrieved 2009-06-21. ^ a b "Territorial Courts". History of the Federal Judiciary. Federal Judicial Center. Archived from the original on May 14, 2009. Retrieved 2009-06-21. ^ "U. S. Courts | Frequently Asked Questions". Archived from the original on 2009-05-26. Retrieved 2009-05-26. ^ Federal Judgeships, United States Courts. ^ Title 28, United States Code, Chapter 85. ^ See, e.g., 28 U.S.C. § 158(a)(1) (U.S. district courts are authorized to hear appeals from final judgments, orders, and decrees of U.S. bankruptcy judges). ^ a b "Survey of Admission Rules in Federal District Courts" (PDF). U.S. District Court for the District of Maryland. 2015. Retrieved 2017-10-16. ^ Local Rule 83.3, Local Rules of the Southern District of Ohio. ^ Local Rule 83.1, Local Rules of the District of Puerto Rico. ^ Border Crackdown Jams US Federal Courts (May 7, 2007). ^ Goldman, Russell (July 23, 2008). "What's Clogging the Courts? Ask America's Busiest Judge". ABC News. ^ a b c Willoughby Rodman, History of the Bench and Bar of Southern California (1909), p. 46. Links to researching court records and also National Archives: Records of District Courts of the United States (Record Group 21) 1685-1993.